A compilation of works from previous recordings. Peter Elliott voice. 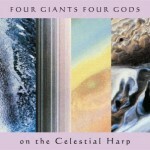 Robin Armstrong indirectly on the Celestial Harp. 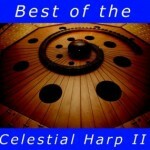 Two voice tracks, one singing and one humming were played with a Celestial Harp track. 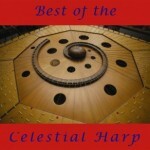 In the final mix the Celestial Harp was removed and the singing and humming were left on their own. 3. Bird 6’34” Peter Elliott voice. 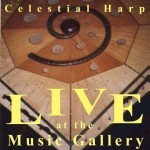 Robin Armstrong on the Celestial Harp. There is no explaination for this piece. It just happened! Peter made all the sounds in one take accompanying the Celestial Harp. 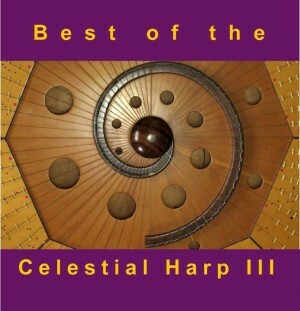 Robin Armstrong and Michael Moon on the Celestial Harp, voice and other effects. The sound of Saturn recorded by the NASA Voyager flights and transformed to an audible frequency by Brain Mind Research, was used as a main drone against which the Celestial Harp and voices were added. Robin Armstrong on the Celestial Harp and playing a kaossilator. An ebow was used on the Celestial Harp to make extended sounds. Robin Armstrong voice. A matrix of multiple tracks were made of Robin chanting in rhythms of 4, 8, 16, and 32 as well as 13, 26 and 39. The result creates an effect that can take the perceptive listener to other dimensions.